It’s no secret that Akai has their own way of doing things. For them, small but flashy controllers are the way to do things and this is a strategy that has proven to be quite fruitful. The Mini MKII is a perfect example of this. With its super-compact chassis, flashy red and black color theme, and several smaller aesthetic details, the MPK Mini MKII turns heads wherever it goes. From a functional point of view, the size makes it a great tool for live performance, working on the go or simply if you want something that doesn’t take up half of your desktop. The build quality of this particular controller is excellent too – it feels built to take some abuse! Although it is considerably smaller than most of its competition, the MPK Mini MKII still has a few tricks up its sleeve. To begin, this model features 25 synth-style mini keys, which isn’t a surprise considering the size of the thing. However, Akai has managed to make enough room to squeeze in eight backlit pads that are velocity sensitive and feature full level as well as note repeat. Then we have eight fully-programmable knobs. As for the ‘tricks’ that we mentioned, the MPK Mini MKII comes packed with a built-in arpeggiator and a thumb stick instead of the standard pitch jog wheels – these function very well and are a great alternative to the norm. On the software side of things, there is plenty on offer, including two awesome synthesizers – Hybrid 3 and SONiVOX Wobble – and MPC Essentials. While the features are pretty cool, what really sets the Akai Professional MPK Mini MKII apart from the competition is its performance. Or should we say ‘its performance considering the low price’. Starting with the hardware, every key, knob and button feels responsive and smooth during use. The keyboard also offers decent feedback for a synth-style package on a budget controller. The same goes for the pads, making them great for triggering during a live set. Another thing worth mentioning is the borderline stellar compatibility with both Windows and Mac machines, as well as various DAWs. Ultimately, Akai has found the winning formula and they are still running with it. As users, it is hard not to appreciate that. Akai has solidified their position as one of the godfathers of the MIDI controller market. The MPK Mini MKII represents everything that’s good about this brand and proves how much you can do with such a small controller – and small budget. If you are just starting out and need a solid, versatile MIDI controller, this one is definitely worth adding to your shortlist. 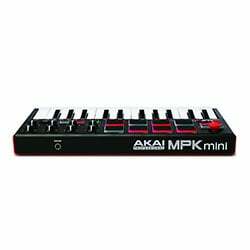 For more info about the Akai Professional MPK Mini MKII, click here.